Ellon and District councillor Gillian Owen recently visited the eyesores within Ellon, that she highlighted a week ago. 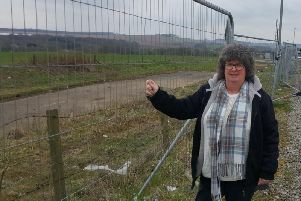 She had written to Aberdeenshire Council about the "shoddy state" of the grassy area by the former Ellon Academy, the stairs leading to the Castleton development and overgrown weeds outside the Ythan Centre. Council officers had visited all three locations last week to tidy up each area. Following her visit Gillian said: “I’m delighted to see a vast improvement. My thanks to the landscape Services Team in Ellon for acting so quickly to my complaints.